One week before the Tour de Victoria I headed out on my last major training session with the intention of riding one section of the new 60 km route that I didn’t know — the second quarter that runs from Victoria General Hospital up to Elk Lake. I’d heard rumours of killer hills there so I figured it would be good to ride it at least once before the day of the ride. I rode out along the E&N Rail Trail to where it meets the Galloping Goose and soon found myself coasting down a curving hill on Burnside Rd West. I was admiring the pretty agricultural land when I felt a weird wobbling sensation from my rear wheel. Oh no — a flat tire! Bike riders often get flats so many carry pumps and patch kits or even spare tubes with them. Well, I didn’t have anything with me on that day. After cursing my poor preparation for a minute or so, I checked my phone and learned that the nearest bike shop was a 45-minute walk away. The nearest gas station was 20 minutes away, but there was no guarantee that I could fix a flat there so I decided to walk 25 minutes to a bus stop where I caught the #14 to downtown (another 25 minutes). There, I walked my bike to MEC with the plan of buying a new tube and getting back on my training ride. MEC has a great setup where you can either pay them to work on your bike or use their tools to fix your own. I popped my bike up on a stand and took off my rear wheel. As I pried off the tire I noticed some green stripes on the rubber of the tire. At first I thought maybe it was paint, but then I realized it was a sign that the tire had worn right through. No surprise I got a flat — the tire was completely bald! Guess that’s a sign of just how much riding I’ve been doing. So I bought a new tire and a new tube, got them on the rim, and was back rolling on my bike within two hours of when the flat occurred. At that point, however, my window of time was running out so I couldn’t take the time to ride back out and continue from where I left off. Still, I was so glad I wore out the tire then or it might have happened on the day of the ride! Of course, this also meant that on ride day, I still wouldn’t know what to expect from that part of the course. Oh well, I had to hope that all my training throughout the summer would be enough to deal with whatever I encountered. My buddy Mike came down from Nanaimo to join me on the ride as he has in the past. He arrived later on Friday evening and we stayed up till midnight catching up. But then, even though I was exhausted, I endured a very poor sleep. When 6:30am rolled around and my alarm woke me up, I’d only enjoyed a few hours of solid sleep — not ideal for a big ride day. Luckily, the start time for the 60km ride was 8:30am, not 7:00am like the 140km and 160km rides. 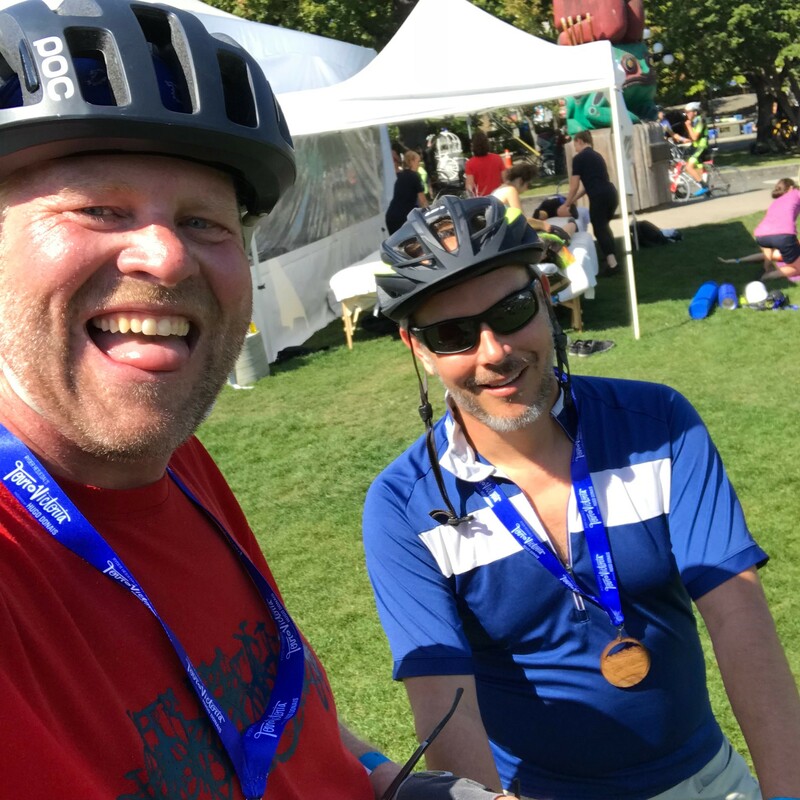 As I chugged my first coffee and tried to clear my bleary head, I texted my friend and fellow blogger Travis Paterson just before 7:00am to wish him luck as he set off on his first-ever 140km ride. He told me he hoped to arrive at the finish line by 1:30pm. My own expectation for the 60km ride was that it would take me at least 3 hours, maybe 3 and a half. My plan was to take it relatively easy at first and then push harder later if I had the energy. It was a beautiful day for a ride — a little on the cool side, but the skies were smoke-free, which was a relief, especially considering the solid week of choking smoke we endured immediately afterwards. 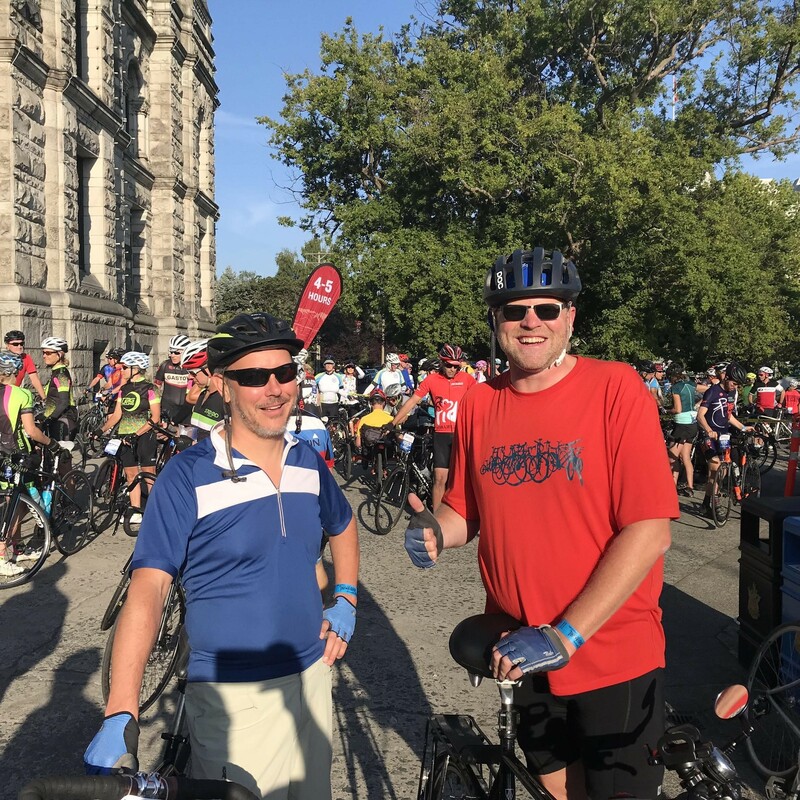 After breakfast and more coffee, Mike and I rode downtown to the Legislature to join the big herd of riders departing on the 60 km and 100 km rides. It was a nice change from past years when we had to take the shuttle bus up to Sidney for the 45 km ride. But it also meant that we were part of a very large group of riders all departing at the same time. 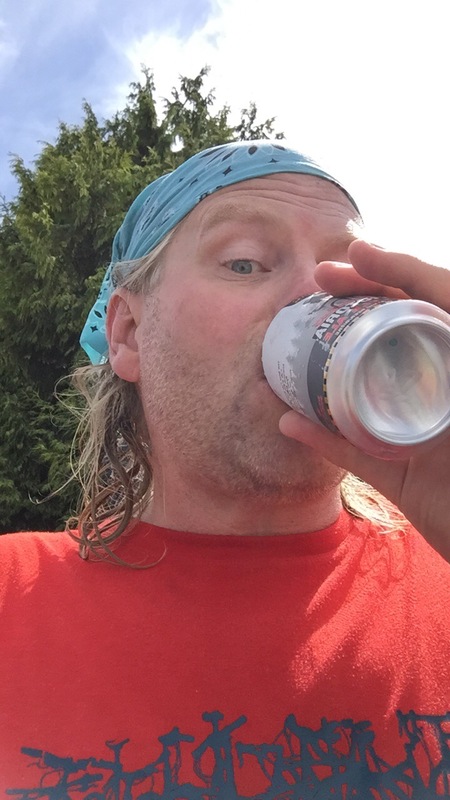 The first quarter of the ride out to View Royal was nice — there were a couple hills along Craigflower Road and the Island Highway that tested me, but I was feeling good, and I ended up pushing a little harder than I had planned. Soon enough, we were in the second quarter of the ride. I pointed out the very spot where I got my flat to Mike, and from there on I was in unknown territory for the next 10 km. This was where the 100-km riders split off from us to get in their extra distance, which loosened up the congestion of riders a bit. There was an aid station there, too, where we took a short break to recharge our water bottles and have a quick energy-boosting snack. So far so good, but right after this break there was a nasty hill. 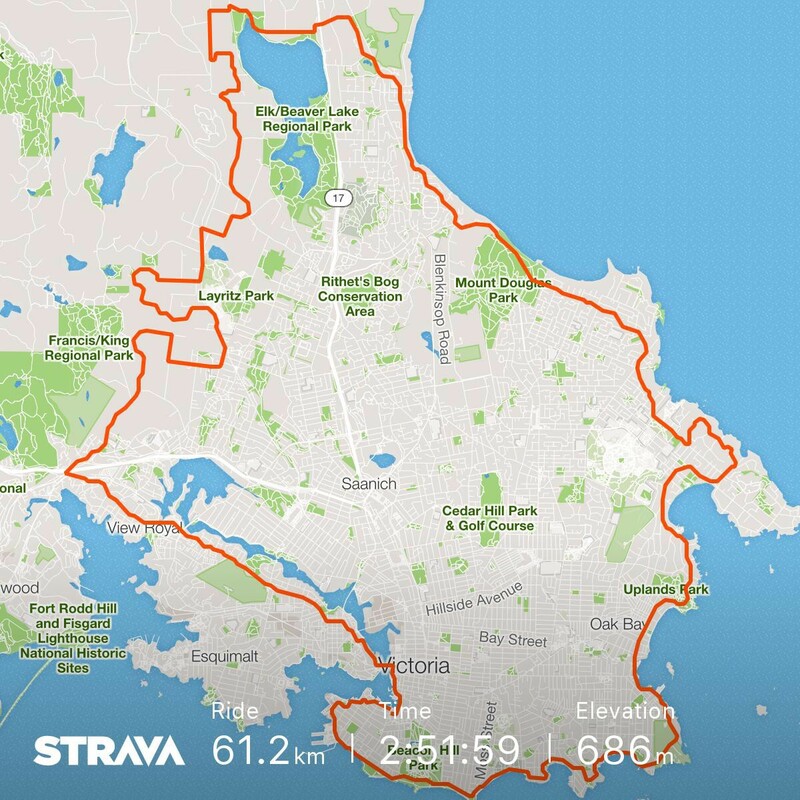 I remember thinking it was the steepest hill I’d ever climbed, and according to Strava it’s one of the highest elevations (105 m) on the route. But I just dropped down into my lowest Granny gear and made it all the way up without getting off my bike. That small success buoyed me as we continued on towards the west side of Elk Lake where I knew some more hills awaited us. Indeed, on Old West Saanich Rd we climbed steadily for a long time (up to 124 m, the highest point on the route according to Strava). The steep, winding downhill that followed was fun but a little harrowing, especially since the road was not entirely blocked off to cars so we had to be careful. And then we were zooming along the north side of Elk Lake. This is one of the nicest pieces of pavement I’ve encountered in Greater Victoria. The recently poured asphalt was smooth and clean, and just a joy to ride on. When we passed Hamsterly Beach at the top of the lake, a spot where my family often goes swimming in the summer, I was sorely tempted to take a slight detour for a quick cooling dunk. We were now about halfway done the ride. Once we crossed the Swartz Bay Highway we were back on familiar roads. We felt the air cool considerably as we got closer to Cordova Bay and made another pit stop for fluids and snacks at an aid station, but we were both keen to get back in the saddle and ride now that we were past the halfway point. I was still feeling good at this point, but I knew a couple of challenging hills awaited me, and I wasn’t 100% how my body would react. At the Ash Road Hill just south of Mount Douglas, an old nemesis of mine, I was encouraged by the sight of my brother and sister-in-law cheering me on. That was all I needed to push myself up that brutal climb. Soon enough we were rounding the corner in Cadboro Bay and beginning the run through the Uplands and into Oak Bay. The long, slow climb up from Cadboro Bay was especially tough for me, but when we turned into the Uplands, I decided to skip the aid station there — I just wanted to keep riding to the finish. Perhaps that was a mistake because pretty soon I began to feel a sense of exhaustion invading my body. I think it had more to do with the poor sleep I’d had the night before than anything else, but whatever it was, I was really struggling. I’m not much of a conversationalist while I ride at any time, but from here on I pretty much stopped talking entirely. Mike chatted away, trying to keep my spirits up (I could tell), while I occasionally growled a curt response back if I even said anything at all. I was grumpy for sure. I wanted the ride to be over right then and there! But the good friend that he is, Mike stayed with me and encouraged me when he could have easily gone ahead and hung out with some friendlier riders. All through Oak Bay I envisioned the last nasty hill of the ride waiting for me at Gonzales Point. It’s one I never enjoy, but I had purposefully pushed myself to ride it a few times in the summer to bolster my confidence, so even though I was exhausted and grouchy, I still knew I could handle it. And I more than just handled it – I conquered it! From there on, it should have been easy, but I still had this overwhelming feeling of exhaustion — so I just couldn’t seem to get my energy up to enjoy the last 5 km of the ride. I was mad at myself for it, too. Why couldn’t I push harder? Where was my finish line surge? Finally, as we turned the corner by the Cruise Ship Terminal in James Bay, an older gentleman passed us. This silver-haired fellow was also riding the 60-km route, but I didn’t recognize him, which meant he had probably been behind us for most of the ride and now had caught up and passed us. For some reason, this turned the key inside me that unlocked my last bit of reserve energy. I looked at Mike and said “Let’s go!” and started pushing. We kept pace with the senior citizen a few bike lengths ahead of us and then as we rounded the final few corners heading towards the finish stretch we caught up to him. And at the finish line, Mike and I were ahead of him by a nose! Overall, I did better than I expected. According to Strava, I completed the ride in 2:51:59, which doesn’t count the rest breaks. My official Tour de Victoria time was 3:01:16. 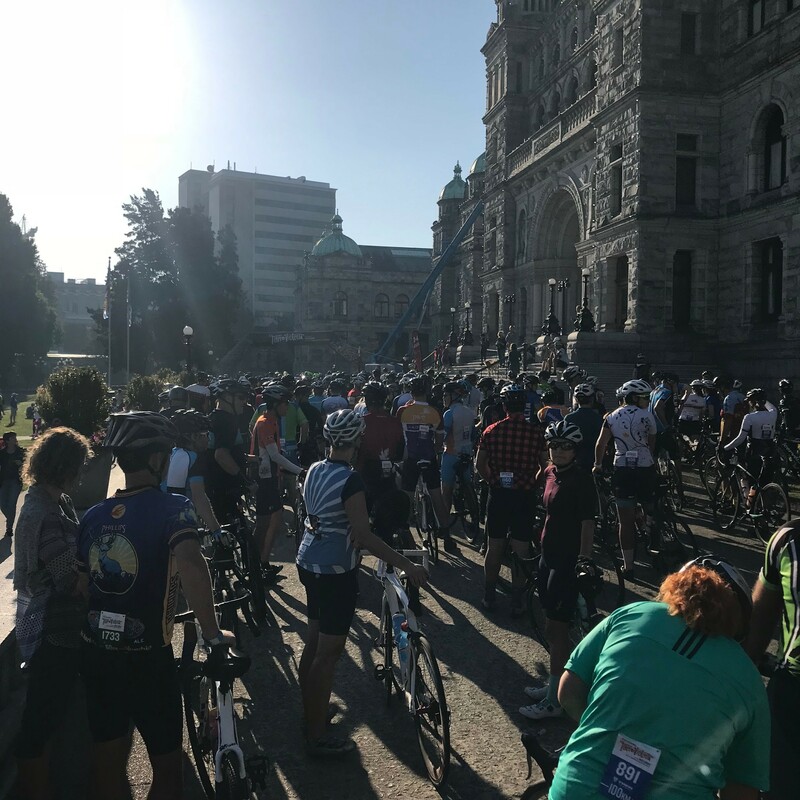 Interestingly, Strava tells me I broke my personal record for that final stretch from the cruise ship terminal to the Legislature — which I had previously set at last year’s Tour de Vic! So obviously I did have something left in the tank for that final sprint. 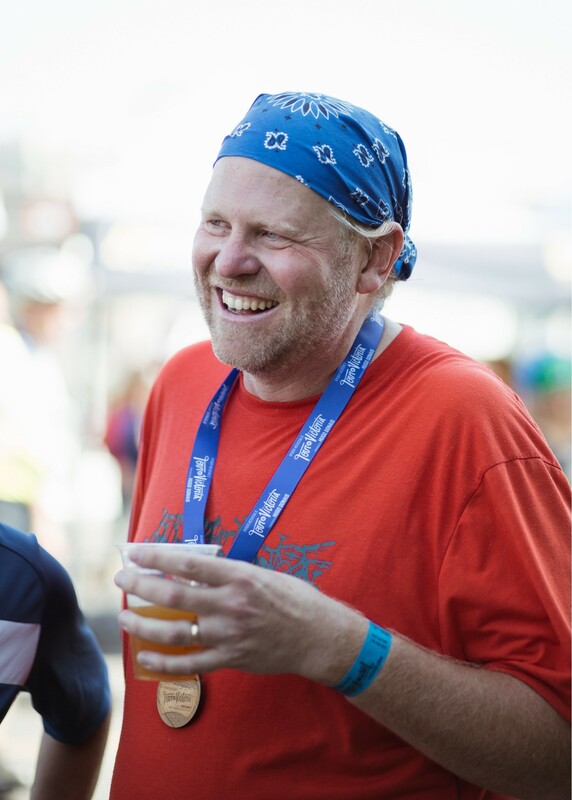 Thanks to Brynn Feather for this great picture she snapped of me enjoying one of my post-ride beers from Spinnakers. Mike and I celebrated our strong finish with a beer (OK a couple!) at the finish line while we waited for Travis to finish the 140. We were there with our beer glasses held high to cheer him as he rolled through the finish line about an hour after us. I was awed by the thought that he had just rode his bike more than twice as far as we had! 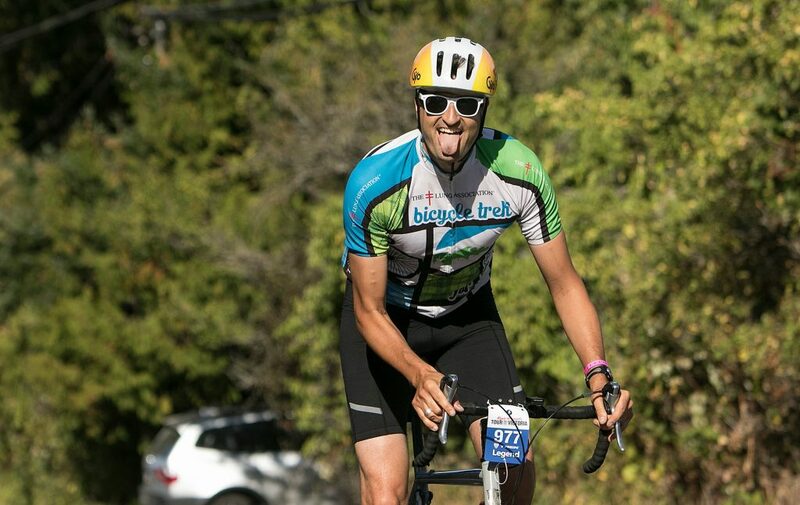 Mike Hessler, Joe Wiebe and Travis Paterson – the Thirsty Riders! 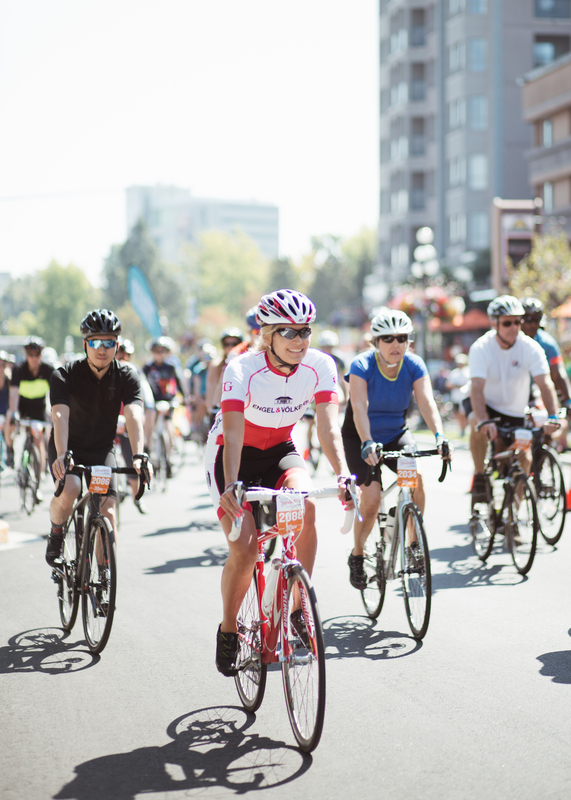 Thanks to everyone involved with the Tour de Victoria for organizing such an amazing event. And now the question is: will I make the leap to the 100 km ride next summer?! 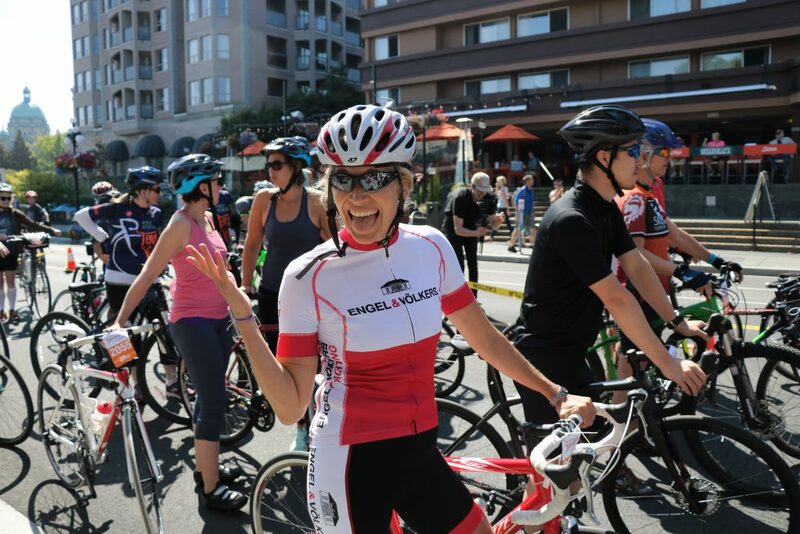 Why the Tour de Victoria really is a ride for everyone! Lets just say procrastination might be human nature, but it is definitely my nature. The intention to train a little or even to ride a little before the Tour de Victoria went out the window when lake season arrived. I pulled my bike out of the garage at 9:00 am on August 18. Two very flat tires and no convenient pump to sort that out. My car was loaded with friends and gear to head up to Tofino for a week (without me) and it was just about to pull out of the driveway when I threw my bike on the roof and had them drop me off at Oak Bay Bikes where the staff kindly pumped up the tires and had a quick look at the brakes, gears and chain and sent me on my way. I rode my bike home. That was my road training. I got home, answered a few work emails to take my mind off the inevitable ride ahead and then put on my riding kit and rode to the starting line: my warm up. At the start of the 30km ride. Aware that I had done no road training at all, I only signed up for the 30 km bike ride. And I was still painfully nervous about it all. Thank you to Tami Tate who reminded me at the start line that this is a ride and not a race. And 30 seconds into the ride, I couldn’t have been more glad that I signed up for the ride. The weather was perfect. The riders were so kind and friendly. The roads were safe and the route was beautiful. I chatted with parents of children who were riding and was amazed at the effort and ability of the young riders. 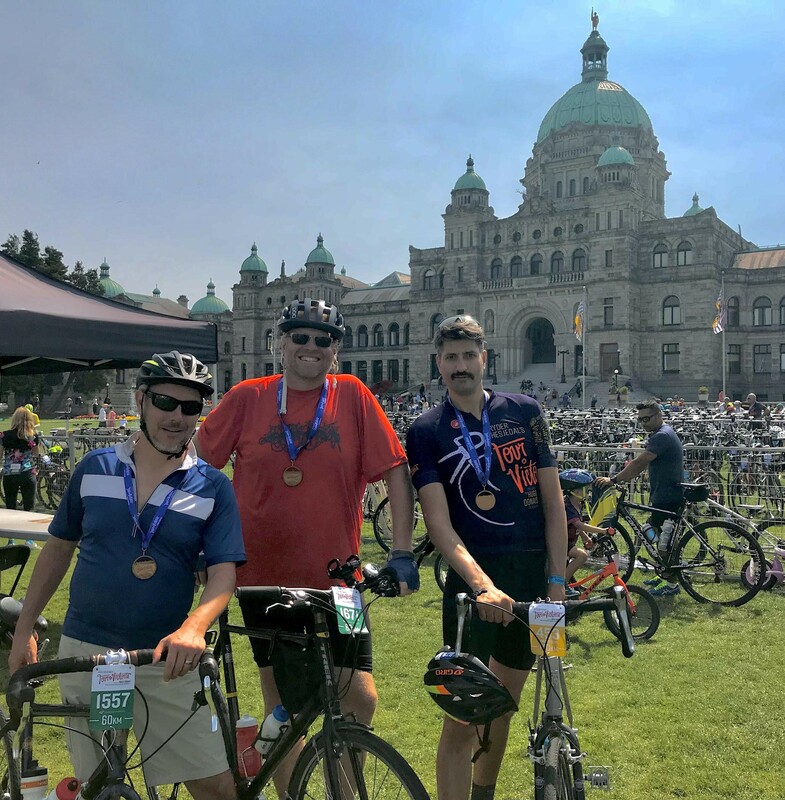 I rode alongside riders of all ages who were completing all different lengths of the Tour de Victoria in various states of exhaustion and euphoria. The tour was organized so well. There were so many volunteers helping and traffic control creating the most amazing riding experience. The 30 km route was beautiful, but not a riding challenge. I enjoyed the ride and to my husband’s chagrin, didn’t make it a race. My enthusiasm for the ride has spread and I have been collecting new riders at each and every bbq, gathering and relaxing afternoon on the dock at the lake. Next year it will be the 60 km ride or maybe even the 100km. The finish line. I’ll be back! -Sandi Piercy is a Real Estate Advisor with Engel & Volkers Vancouver Island. She is a member of SPINCO Victoria and is looking forward to seeing if her hours on the spin bike translate well to the road bike in August. My name is Sandy Fleming and my wife Kim and I are from North Vancouver – both of us have ties to Vancouver Island. Kim was born and raised in Duncan and my family was Navy – growing up in Esquimalt.  So, returning to Victoria for Ryder Hesjedal’s Tour de Victoria is a bit of a homecoming for both of us. We are both retired so have more time now to cycle in general and to prepare for the TDV. 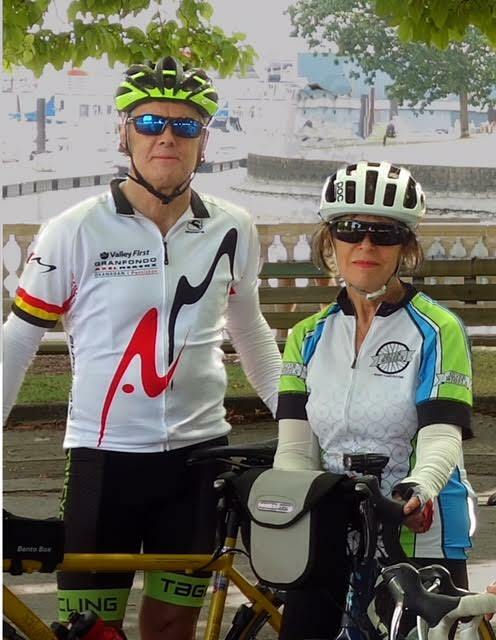 We ride with the Silver Wheels, a cycle club registered with the West Vancouver Senior’s Activity Centre and we also train and ride with the TaG Ride Club, located in North Vancouver. The Silver Wheels is mainly a social ride club but of course when you have a group of cyclists, the pace to the mid-ride coffee stop often becomes more competitive than “social”. Silver Wheels has 80 members and 35 of us are registered for the TDV this year, up from 20 last year (I’m the team captain). TaG is a training and competitive cycling club originally formed by Leslie Thomlison and Gina Gran with a focus on training, skill development, and competition for both road and mountain bike. TaG has a great indoor studio and started an outdoor ride club just last year, with well over 100 members now. TaG expects to have over 50 riders at the TDV as this will be the primary club event for outdoor training this year. 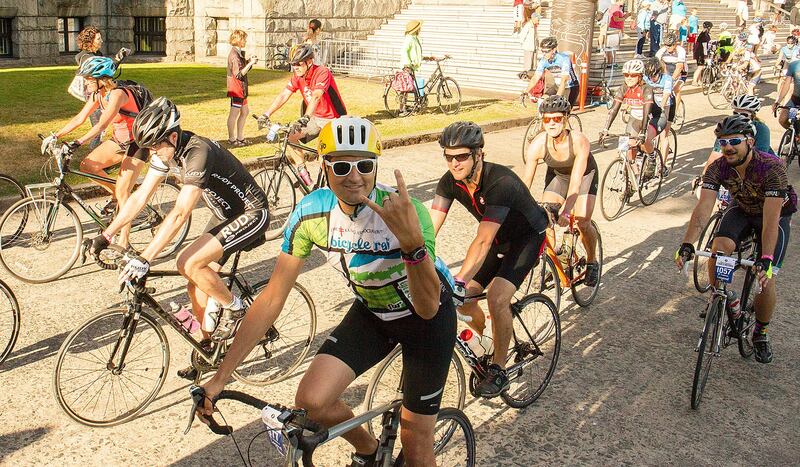 So nearly 100 North Shore riders are coming to Victoria for the TDV! 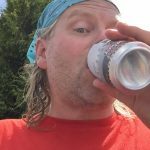 I’m torn which club jersey to wear – last year I rode wearing my TaG jersey and switched to Silver Wheels for the beer garden. I have participated in the TDV for the past 6 years, only missing out on the inaugural event in 2011 and riding the 140km route every year. Somehow I’ve improved my time each year, including the very wet and cold event in 2013, but not sure if that record will continue. 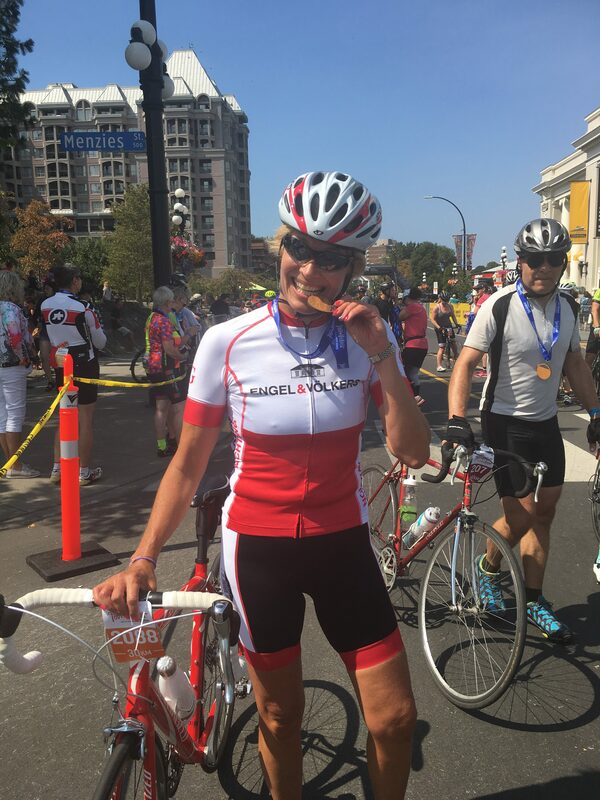 Kim accompanied me every year and was my cheering section the first two years, but then decided that riding would be more fun than watching, so she has ridden the past 4 years, including the 90 km route the past two years – 100 km this year. Our club rides are typically 50 to 80 kms, 3 times per week weather permitting, so we get in around 200 kms of riding per week with a bit more when we get closer to the TDV. We expect to be doing lots of north shore rides over the summer plus some endurance rides with TaG to get ready, and maybe some extra long rides on the weekends. I have ridden in other Gran Fondo’s and similar cycling events, but have found the community spirit, organization (beer garden! ), and great routes makes the TDV the most enjoyable one we have participated in – especially the families who sit at the side of the road cheering you on. We have encouraged other cyclists we ride with to try the TDV, especially for their first mass cycling event, and many of them have also returned for subsequent years. So we’re off to England for a vacation now – with some easy rides in the countryside planned. We will have some conditioning catch-up to do when we get back!